Mentors Academy has achieved an unbeatable and enviable record of success in Bank po Coaching in chandigarh. For imparting the best coaching for the various competitive exams. At Mentors Academy, we have put in years of experience and utmost dedication to make Best Bank PO Coaching in Chandigarh for IBPS/SBI bank exams. Our coaching methodology is result oriented. Our faculty is highly educated, most of them have appeared in civil services examination with high performance. Mentors Academy is adjudged as the top Bank PO Coaching in Chandigarh. MENTORS ACADEMY INSTITUTE is offering best coaching for BANK PO, BANK CLERK, and BANK SO with competitive study material to match the latest exam pattern and syllabus. Faculty members are well-versed with the banking exam pattern and most are from the banking sector. The student-friendly atmosphere is created to get the best outcomes for them to crack the exam. Free library facility is provided to encourage dedication and enthusiasm in the students. Free online test series are provided to train them to appear in the online test mode of Bank Exams. Regular doubt sessions are conducted by the existing faculty members to give comfortable learning to the students. 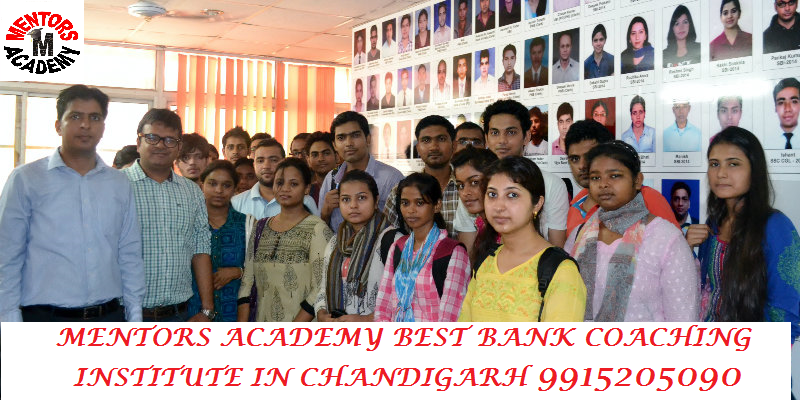 Why MENTORS ACADEMY Institute in Chandigarh is considered to be best for BANK PO examination? There are several coaching institute which offers their services to students who want to appear in competitive exams. As the competition is increasing day by day, students want to go with secure job opportunities. So, banking sector is one amidst many which ensure candidates with secure job posts. But, it is not easy for candidates to get job here easily because they have to clear varied examination.
. It set a benchmark in the field of various competitive examinations as its passed results are very high. its facilities are very unique and dynamic which are enough to make it best amidst all. Free demo Classes for enthusiastic candidates. Well-developed infrastructure which provides candidates with very optimism environment. Highly educated, trained and skilled faculties member who provide candidates with 100% result-oriented teaching. Make you familiar with complete syllabus according to latest examination notification. Provide you with highly friendly but very competitive environment so to remove your all fear and nervousness. It would help you to understand the pattern and style of the Bank PO examination. Provide you with best and high-quality study material specially designed after many analysis and perfectly aligned to latest syllabus. Weekly doubt sessions, which are specially organized to clear doubts, improve weak arenas of the candidates. Compulsory Mock tests sessions for candidates which are more than enough to get glimpse of actual examination. Online approach of MENTORS ACADEMY Bank PO Coaching Classes Chandigarh is 24*7 accessible so to facilitate candidates. Teach you with do’s and don’ts during your examination time. A lifetime membership is provided to candidates who enroll in the institution. At Mentors Academy, we teach shortcut tips and instructions for maths and reasoning but we never adopt any shortcut that hampers aspiration of students taking classes with us. Quality of teaching is another factor that should be judged before you select a competitive exam coaching. It can be done by talking to the counsellor or attending demo classes or even best if you can visit the centre and talk to students already enrolled with the institute. We also focus especially on weak students enabling them to at least clear the minimum cut off marks in some of the subjects in which they are not as bright as others. In any case, for all the students we give advice for focusing on clearing cut off marks for each paper. To ensure the same, we teach them accordingly in the classroom sessions. top Bank PO Coaching institute in Chandigarh. Best Bank PO Coaching in Chandigarh. Get familiar with the exam pattern: Coaching institutes are run by the professional experts who are aware of the exam pattern of such competitive examinations. By joining such coaching you will get familiar with the pattern before appearing for the exam. The trainers will also revise the question papers of previous recent years so that you become potentially prepared for the entrance exam. Quality teaching: The trainers of the coaching centres are professional experts with over the years of expertise. They know all the quickest and smartest ways to solve any critical questions and thus prepare their students in the same way. Concept clearing sessions: Coaching centres conduct separate doubt clearing session which enables a student to talk about their weak points and get them cleared. MENTORS ACADEMY INSITUTE Chandigarh is starting new batches for IBPS PO from 16th July 2018. We are offering exclusive batches for bank exams where professionals will be conducting classes. Competitive study material is provided to the existing students to give them a thorough preparation. Coaching and study material are based on the latest exam pattern and syllabus lay down by IBPS. Infrastructure is student-friendly as it has all the amenities required for comfortable studies. Faculty is highly experienced and professional to give the best to the students. The success rate is more than 70 per cent of the existing registered candidates. Come and Join MENTORS ACADEMY to grab the prestigious career of the lifetime. MENTORS ACADEMY has a specially designed IBPS RRB mock test series portal for the registered students to practice. The timetable has a provision of Regular mock test series to give them real-time experience. MENTORS ACADEMY has a team of well-qualified educationists to render quality coaching. Doubt clearing sessions are organized to give personal attention to the students to enhance their knowledge and understanding. Duration of Batches: 90 Days with lifetime membership card, also super 30, fast track batches available. IBPS – RRB –VII notification 2018 have come out with a total of 5249 vacancies for Office Assistants & 3312 vacancies for Officers Scale. Institute of Banking Personnel Selection is a self-governing body responsible to recruit candidates for the Public Sector Banks in India. IBPS RRB EXAM 2018 notification is released. Candidates can apply online by visiting the official website of IBPS. There are some points to be noted regarding the notification of IBPS RRB 2018 Exam. It is a recruitment drive is for Group ‘officers on Scale 1, 2 and 3. This recruitment drive is also open for Group ‘office Assistant for the multipurpose job role. The mode of the examination will be online. An applicant must be Graduate in any discipline to become suitable for this exam. Applicant must be proficient in selected language as given from the rural bank. IBPS PO exam preparation needs proper and authentic study pattern as the difficulty level is much higher than any other competitive exams. There are many topics to be studied therefore one must follow the proper timetable and follow competitive study material to learn the basics and practice the questions subsequently. In the recent IBPS PO Exam held in 2017 have given a surprise to all the aspirants with its new pattern of questions, therefore we would like to guide you before the next exam about the pattern they follow. They have used the innovative way to test the knowledge by asking the questions in the conceptual form. All it needs is a lot of practice on a regular basis so that one does not face any difficulty in the examination hall while attempting IBPS PO 2018. Aspirants must solve previous year question papers of IBPS PO Exam to get the idea about the type of questions asked. Our comprehensive study material and notes are designed according to the latest exam pattern and syllabus lay down by IBPS. We provide free mock tests, quizzes and video lectures for IBPS PO Exam based on the latest exam pattern. It is advisable to join IBPS PO Coaching classes besides doing self-study to update yourself on the latest exam pattern of IBPS PO 2017. MENTORS ACADEMY Institute has weaved authentic classroom programs having exquisite teaching module for Banking and SSC Exams. It has set up a milestone by giving more than 97 percent as success rate in various banking and SSC Exams in the years 2016-18. 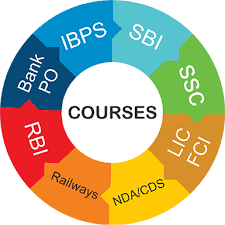 IBPS Exam allows candidates to join any of the nationalized banks listed under its jurisdiction. IBPS conducts online written exam in two phases: Phase1 or IBPS Preliminary Exam and Phase 2 or IBPS Mains Exam. This examination is followed by an interview to examine the awareness and presence of mind to deal with the complex functioning of the bank. The preliminary examination of IBPS PO is held online having three sections with a total of 100 questions to be attempted in one-hour duration. It carries a maximum score of 100 marks. IBPS PO exam follows negative marking with as much as 0.25 marks is deducted for every mistake or wrong answer given by the candidate. Aspirants must touch the cut-off level to qualify the exam in all the three sections. IBPS conducts IBPS PO Mains exam online having 5 sections with a maximum score of 225 marks to be attempted in 210 minutes. IBPS will hold a descriptive paper in IBPS PO 2017 mains exam. After qualifying IBPS PO Mains one is eligible for the Interview session. Aspirants who will qualify IBPS PO mains exam will be called for Interview carrying a maximum of 100 marks. Qualifying marks for an interview for general category are 40 percent and for reserved categories like SC/ST/OBC/PWD, it is 35 percent. Interview phase is for maximum 20 minutes in which bank decided the panel of bank officials to cross-question the candidates during an interview. The topics are based on the banking sector, current affairs, general awareness, etc. Candidates are expected to be well-dressed and must carry all the relevant original documents for verification at the time of interview. The overall ranking of candidates is done on the basis of the marks obtained in IBPS PO mains and interview session. IBPS conducts clerical and officer level examination for various nationalized banks at All India Level. IBPS Clerk Exam preparation is one such exam which has a moderate level and an average student can qualify it. It does not mean that one can appear in the exam with a little and selective knowledge. Millions of aspirants opt for IBPS Clerk Exam which means that competition is on the higher side and needs proper knowledge and lot of practice of the topics given in the syllabus. IBPS Clerk Exam 2017 Prelims held in December 2017 had seen a new pattern with a challenge in English Language Section. This section was more on comprehensive knowledge than only on the basic grammar rules which means that it needs a lot of practice and adequate knowledge of English language. Conceptual knowledge is a must which needs proper guidance and training for IBPS Clerk Exam. Joining IBPS Clerk Coaching is an ideal option to beat the competition and get the best score in IBPS Clerk Exam 2018. To make the preparation exam effective aspirants should solve previous year question papers of IBPS Clerk Exam to acquaint themselves with the exam pattern and types of questions asked. We have developed competitive study material and notes based on the latest exam pattern and syllabus of IBPS. We offer free mock tests, quizzes and video lectures to our existing students for IBPS Clerk Exam based on the latest exam pattern. It is highly recommended to join IBPS Clerk Coaching classes besides self-study to keep you aware of the latest exam pattern of IBPS Clerk 2018. Institute of Banking Personnel Selection conducts IBPS Clerk Exam every year to employ personnel in various Public Sector Banks. Common Written Examination (CWE) was started by IBPS in the year 2011 to select officers and clerks for various nationalized banks enlisted under IBPS Board. Online applications are accepted for IBPS Clerk Exam through its official website for registration of the examination. It is held at All India Level having an online mode. IBPS CWE-VII Clerk Pre-Exam will hold Pre Examination on 8th, 09th, 15th and 16th December 2018. IBPS Clerk Main Examination will be held on 20th January 2018 according to the annual calendar published by IBPS. According to the IBPS 2018, Official Calendar Notification for IBPS CWE Clerk Examination will come in the month of September 2018. The Online Registration for IBPS Clerk will tentatively start from 12 September to 03 October 2018. The candidates who are willing and eligible can register themselves for the IBPS Clerk Exam 2018 by visiting the official website www.ibps.in as soon as the notification appears. Keep a close watch of the same by visiting our page for the latest updates on IBPS CLERK EXAM 2018 notifications. The IBPS Clerk exam (CWE 7) to select candidates for the required posts will be conducted online. The exam will be held in two phases: Preliminary and Mains. The IBPS Clerk preliminary examination has three sections of one-hour duration where 100 questions are asked. It carries 100 marks. IBPS Clerk Pre exam monitors negative marking by deducting 0.25 marks for every wrong answer. Aspirants need to clear the sectional cut-off set up by IBPS for every Clerk Exam in order to qualify the exam. Candidates who qualify IBPS Clerk Prelims have to appear in IBPS Clerks mains exam. It is also held online. The latest exam pattern states that the question paper will be divided into four sections having 190 questions to be completed in 160 minutes. It carries 200 marks. There is a change in Computer Aptitude and Reasoning Ability sections were separate last year but this year these two topics will be merged into one section having 50 questions. This section will be of 45 minutes duration. Every aspirant should attempt the sections in the given order and within the time allotted as fixed by the examining body. The candidate is not allowed to leave the existing section before the time allotted. The next section can only be attempted after solving the current section. IBPS Clerk Mains exam also has negative marking with a deduction of 0.25 marks for every wrong answer. MENTORS ACADEMY Institute is taking IBPS Clerk classes. We start fresh batches every week. We have given an outstanding result with as much as 97 percent success rate every year. Encouraging results are the outcome of our specialized faculty. SBI PO is more competitive exam compare to other exams and at MENTORS ACADEMY Chandigarh we have framed a dedicated SBI PO Batches with result oriented classroom programs, outstanding SBI PO coaching module, Mock Test and Study Material for SBI PO. We also invite working managers of SBI PO successor who have been studied at our exam to share their experience. So if you want to be part of largest PSB in India and looking for promotion and perk. Yes, Before, Joining SBI Coaching Classes at MENTORS ACADEMY Chandigarh Review Important information OF SBI PO 2018 here. The SBI PO recruitment exam is the most preferred exams among various public-sector bank exams in India. The difficulty level of SBI PO Exam is higher than other bank exams such as IBPS and RBI. This is an online examination where the candidates have to solve the question paper in one 1 hour. It carries 100 marks. The question paper is divided into 3 sections. Candidates must clear the cut-off for each section. The candidates must qualify the cut-off or minimum passing marks for each section as decided by the Bank to get the job. Every year cut-off is calculated on the basis of the difficulty level of the question paper. The SBI PO Main Exam carries 250 marks having an objective test of 200 marks followed by a descriptive test of 50 marks. Both the Objective and Descriptive Tests are conducted in online mode. Candidates have to answer Descriptive test by typing on the computer. The Descriptive Test will be conducted immediately after the completion of Objective Test. There is separate timing for each section. The Descriptive Test carries 50 marks and has the duration of 30 minutes. This is conducted to analyze the writing skills in the English Language through Letter Writing & Essay Writing. The evaluation of Descriptive Test paper will be done only for those candidates who have scored qualifying marks in the Objective Tests and are placed at sufficiently higher rank to match the placement cut-off. For every wrong answer, there is a penalty of 0.25 marks in both the objective tests i.e Prelims and Mains Exam. There is no penalty for leaving a blank question. The total marks of candidates qualifying in both the Objective Tests and Descriptive Test will be arranged in descending order for every category. The required number of candidates will be called for Group Exercises and Interview as decided by the bank authorities. Group exercise is of 20 marks and Interview is for 30 marks. MENTORS ACADEMY is successfully running regular batches for SBI PO Exam 2018. We have given outstanding results with the dedicated efforts given by our well-educated faculty members with as much as 97 percent. Subject Experts are having relevant experience in the subsequent field which makes the training exam effective. Finally, the Wait is over!! !…SBI has come up with a surprising number of vacancies for SBI CLERK 2018 Exam. It has released 8301 vacancies. It is indeed a golden opportunity for those candidates who could not qualify for SBI CLERK EXAM 2017, can BANK UPON the comprehensive study material and highly qualified teachers to qualify SBI CLERK EXAM 2018. To make it more convenient MENTORS ACADEMY INSTITUTE has structured special SBI Clerk Coaching batches at MENTORS ACADEMY Chandigarh. Let us discuss some essential points regarding SBI CLERK 2018 notification. Please make a note of it before you apply for the post. There will be two stages of examination in SBI CLERK 2018 as Phase I and Phase II. Phase I Exam is a preliminary examination with online mode consisting 3 sections of one-hour duration. The total marks for the test will be 100. There will be a sectional time limit in SBI CLERK 2018 Exam, therefore, it needs a professional training and practice before the exam. Language Proficiency Test (LPT) – Those who will be temporarily chosen from the online examination needs to undertake language proficiency test (LPT). The language proficiency test will be conducted in the Official / Local Language of the State concerned. The candidate who will not be expert in the Official/Local Language would be disqualifiedPhase II will be held online. IBPS – RRB –VII notification 2018 have come out with a total of 5249 vacancies for Office Assistants & 3312 vacancies for Officers Scale.Institute of Banking Personnel Selection is a self-governing body responsible to recruit candidates for the Public Sector Banks in India. IBPS RRB EXAM 2018 notification is released. Candidates can apply online by visiting the official website of IBPS. The exam pattern of IBPS RRB 2018 officer level and Assistant level exam is different. HOW MENTORS ACADEMY OFFERS BEST SSC COACHING & BANK PO COACHING CLASSES In CHANDIGARH? Our faculty members are from the banking sector. We have high fame student group to learn in a friendly atmosphere. Professional classroom sessions. We are providing doubt clearing sessions on regular basis. We are offering comprehensive study material. The student can download our online coaching video sessions. We work on teaching short tricks and techniques for complex subjects like Quantitative Aptitude & logical reasoning. Offering you personal attention to the students as the batch length is limited to 15-20 students. Weekly mock tests designed with the latest pattern and syllabus. Providing free online tests series to the existing students. How to give boom to bank exams preparations in Chandigarh Sector 34? Banking sector is one of the greatest job providers across the nation. It offers numerous job opportunities to candidates every year. It not only provides candidates with good salary packages but also provide them with huge benefits in in the form of perks, allowances, facilities etc. Hence, it is the matter of prestige if one gets job here. It is not very easy to clear bank examination by self-study as professional guidance and training are necessary to enlighten the way of success. There are several strategies, tips and trick which enhance the performance of candidates in relation to speed, accuracy and precision which are only available at best and prompt bank coaching institute. MENTORS ACADEMY bank coaching institute in Chandigarh Sector 34 offers candidates, impeccable and complete classroom training programme for the preparation of Bank probationary officer, specialist officers, clerical exams conducted by IBPS, SBI and other associate banks of SBI. It strongly believes that a candidate needs proper and specialized guidance in decision making and interpretation. It gives complete and exclusive assistance to candidates at every stage, so that entire course becomes smooth and enjoyable to them. Provide candidates with Optimism environment for studies which make them more driven towards their studies and thus become more dedicated and hard working. Highly skilled, trained and educated faculties who provides candidate with cutting-edge knowledge, smart tricks, tips and strategies. Regular and prompt classroom session throughout the course as candidates’ time is very precious. High quality study material designed by expert team after vast analysis and researches and perfectly aligned to latest bank examination pattern and style. A series of mock tests are conducted to ensure that candidates are well prepared, and they can apply what they are learning in the institute. These mock tests give them a glimpse of actual examination and thus reduce the chance of fear during final exam and perform at their level best. Our coaching is totally based on 100% result-oriented approach. Our teachers strive hard to find out new and enhanced technique which give boost to candidate performance. A unique approach of MENTORS ACADEMY Bank Coaching Institute in Chandigarh sector 34 is its doubt clearing sessions. These are highly effective in empowering candidates to overcome their doubts which act like a hinderance in getting the concept clear in the minds of students.